Most pizza in the USA is Godawful. You don’t have to agree with me, but it’s still true. What you get at Round Table or Godfather’s or almost any other American pizzeria is horrible. Worse than the pizza itself is the indoctrination: people actually believe that a extra-large combination with pineapple and ham is what you get in Italy. Excuse me while I go take a shower. I feel dirty just typing that. The closest you can get to actual pizza in America is either a place in an Italian neighborhood that sells by the slice (proper etiquette: fold the slice in half lengthwise to allow the oil to run down onto your shirt, then walk like hell while eating it) or a place with a wood-burning oven, but even then you’ve got a 50-50 chance of getting decent pizza. But! 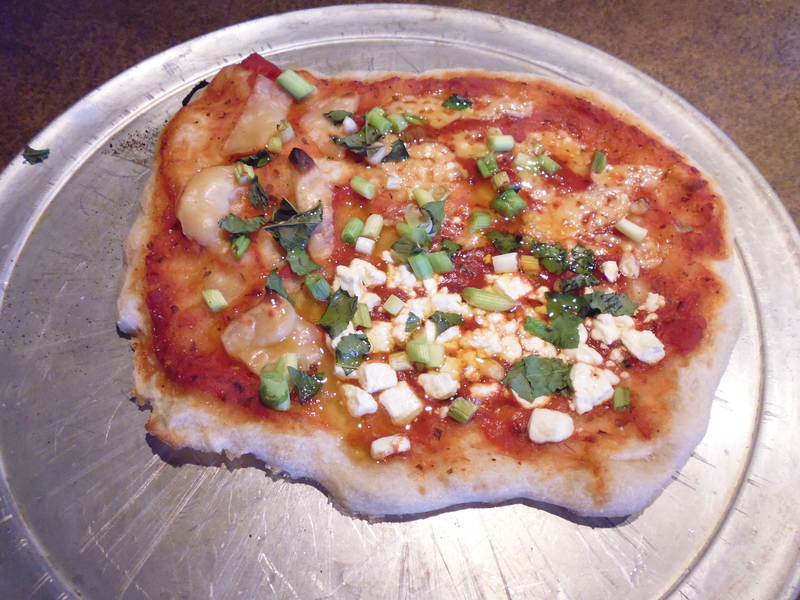 You can approximate decent pizza in your own kitchen. If all you’ve ever had is franchise pizza, it will be strange and unfamiliar in many ways, but you might experience an epiphany and begin to cry over all the bad pizza you’ve eaten all your life. Sadly, this isn’t fast. It takes 2 1/2 days before you can have pizza, but that’s how it rolls sometimes with good food. The dough can be frozen after two days in the refrigerator, then completely defrosted and allowed to stand at least two hours at room temperature before using, though it will be much stretchier and difficult to work with. Because this pizza is much smaller and lighter than American pizza, it doesn’t fill you up in the same way, so it’s easy to use all four pieces of dough in one meal for two people. But because they go together so fast and take only a few minutes to bake, it’s no big thing to eat one pizza and then make the next so you can eat them fresh out of the oven. This recipe is by J. Kenji Lopez-Alt of The Food Lab on Facebook and Serious Eats. His recipe is exacting and I am not an exacting type, so I made a few slight adaptations. However, there are a few points that are very important and I have tried to note those in the recipe. Parchment paper is required here. Do not use wax paper or aluminum foil. Just don’t. A pizza stone is not required but it will make the pizza much better; you can also use it for baking bread. You can often find them in discount grocery stores or places like Big Lots. If you use one, be very careful to not bang it around or subject it to sudden temperature changes (i.e. straight from the oven onto a cool surface) because it will break. Semolina acts like a bed of little marbles under the pizza – it will allow the baked pizza to release easily. Nice but not required. Use good-quality toppings. This is not the place for Kraft cheese. Combine flour, salt, and yeast in a large mixing bowl and stir or whisk until salt and yeast are distributed. Pour the water in and incorporate it into the flour using your hands until no dry flour remains on the bottom of the bowl. This will take patience to continually work the dough. If you absolutely cannot get all the flour mixed in, add another teaspoon – that’s teaspoon – of water and mix again. The dough is going to be more on the dry side than on the damp side. Do not expect this to be like bread dough. Put plastic wrap over the bowl – you might be tempted to oil the bowl like you do for bread dough, but don’t – and let it sit overnight, or for 8 to 12 hours. On top of the refrigerator is a good place. Have a look in the morning. It will have risen slightly. 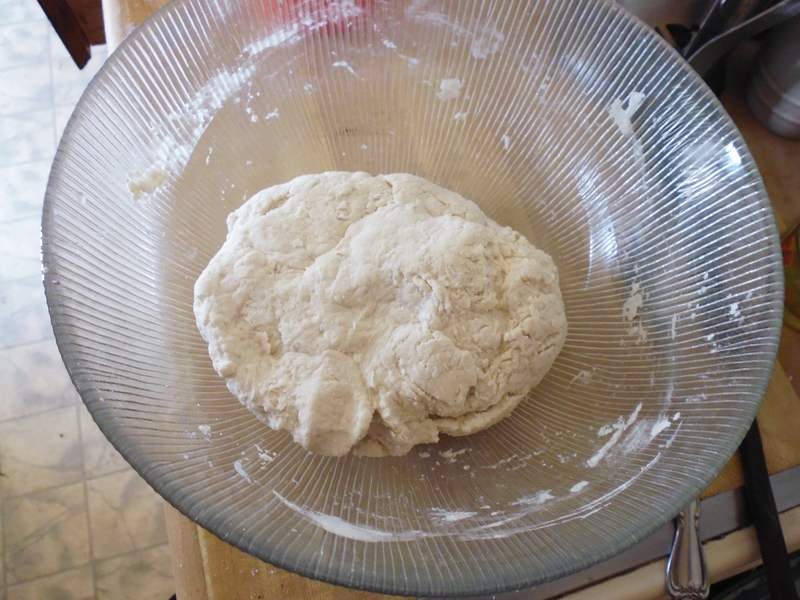 Divide the dough up into four even parts. You may need to flour your hands and a surface to do this. Place each one in a zip-lock plastic bag or a plastic bag that you then tie tightly. Place bags in refrigerator for two days and up to five days. 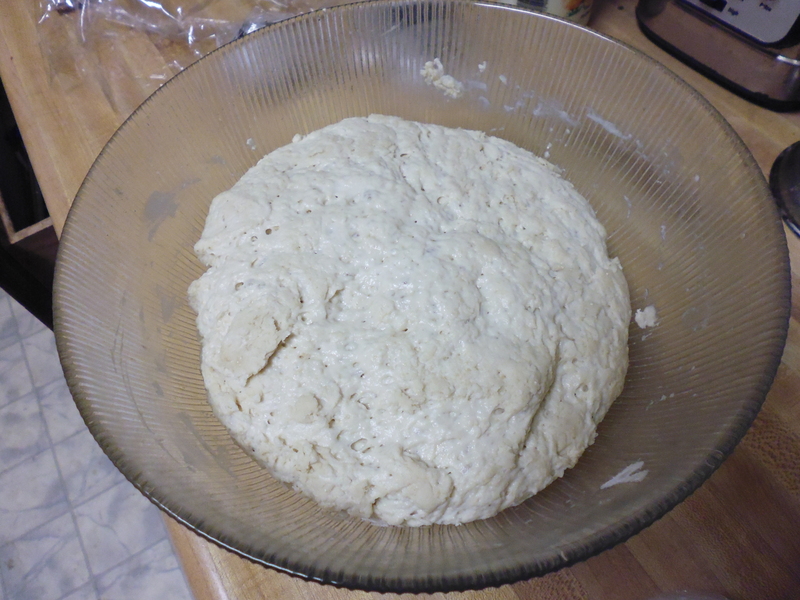 After two days, the dough is ready to use. Remove from the refrigerator and allow to rest at room temperature for at least two hours before baking. If you have a pizza stone, put it on a rack in the oven and turn the oven up as high as it will go. Most American stoves only go to 500F or 550F. Let it preheat at least 15 minutes. Put a piece of parchment paper on a regular metal pizza pan. (Dampen the pan to keep the paper from sliding around.) If you have semolina, sprinkle the paper with a couple of tablespoons and spread it around. 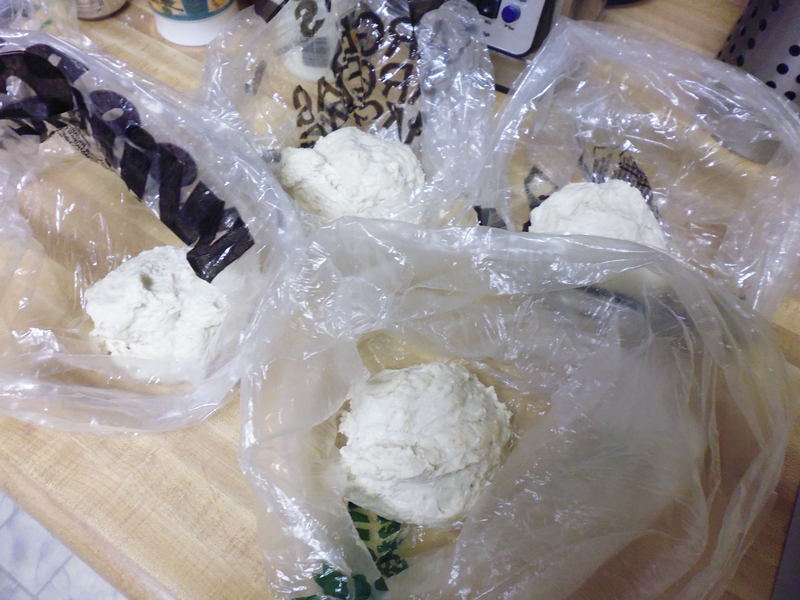 Take the dough from one of the plastic bags. (Turn the bag inside out to get it out easily.) It will be stretchy and a bit gummy, so you may need to flour your hands. Gradually work dough into a disc shape, holding it by one side and letting its own weight stretch it down. This is not an exact science so take your time. 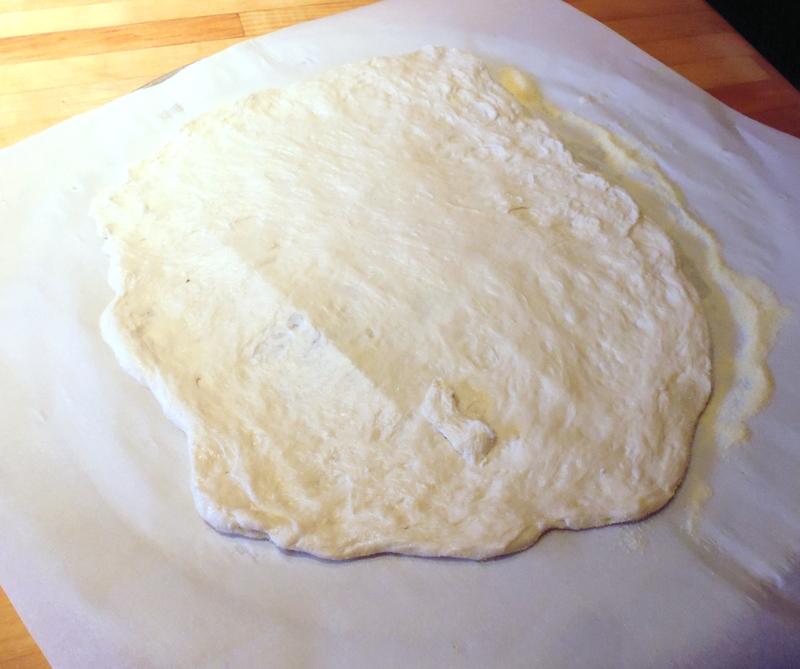 When you have a vague circle of dough about 9″ in diameter, place it on the parchment paper. Patch any holes with dough from the edges. Spread a little sauce of your choice on the pizza, going close to the edges. Do not drown the pizza. Less is more. Top with best-quality cheese, and not too much of that. Here we used three different cheeses to test them out. Top, aged Gouda. Right, fat-free feta. Bottom left, smoked Gouda from the Czech Republic. We sprinkled a few chopped green onions on too. Do not overload the pizza with toppings. I can’t stress this enough. The dough will not get done in the center and the toppings will just steam instead of bake. To bake pizza, open the oven door. Pull the oven rack with the stone out a little bit. 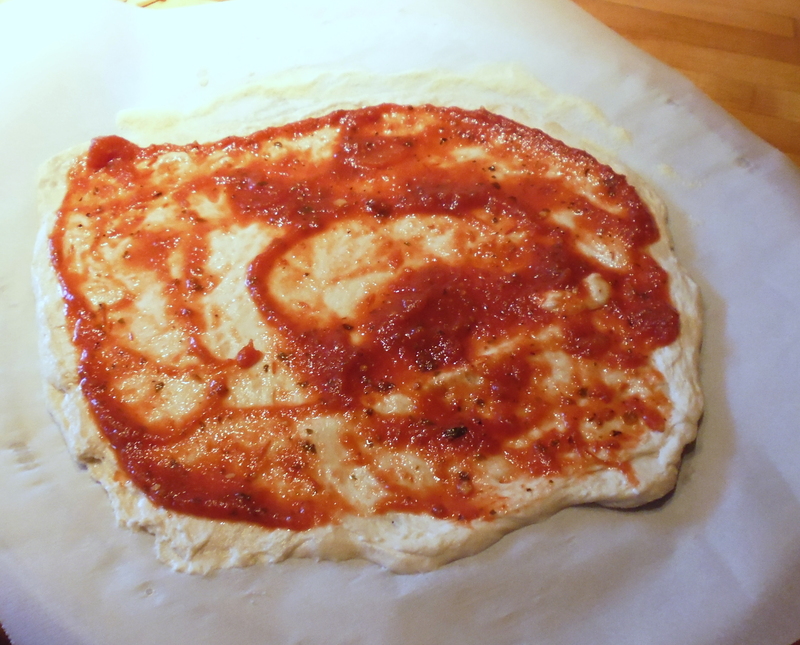 Bring the pizza close to the stone; using the parchment paper, pull the pizza onto the stone. Close the door quickly to maintain high oven temperature. If you are not using a pizza stone, place the pizza on its metal pan in the oven. Watch the time carefully. It might take as little as seven minutes to bake. 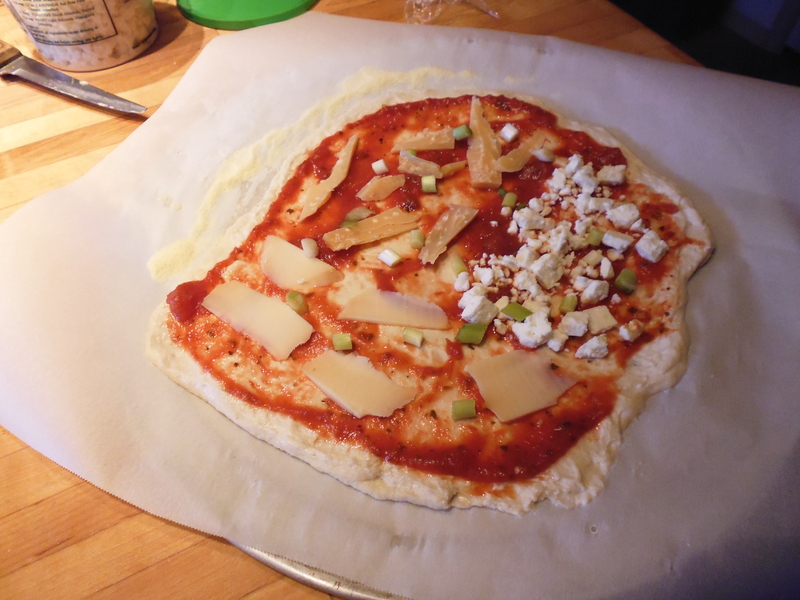 Look for large bubbles to appear around the edges, for the cheese to melt, and the crust to lightly brown. A blackened spot or two is okay as well. 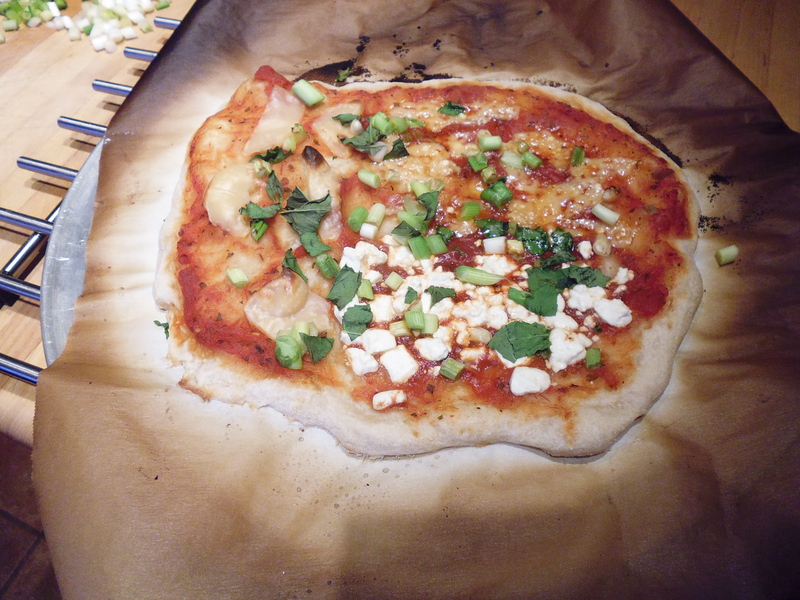 Pull the pizza by the now-blackened parchment paper from the stone back onto the pizza pan. If using metal pizza pan, just remove it to a cooling rack. This is a good time to drizzle pizza with olive oil and toss on some fresh basil leaves. Our consensus on the cheese: quality matters. The Czech smoked Gouda never really melted, but just kind of softened reluctantly and tasted artificial. The feta didn’t melt either, but it isn’t a melting-type cheese. Best of all was the 1000-day aged Gouda, which simply gave up and became part of the pizza, salty, sharp, and smooth. Fresh mozzarella would be swoony. The crust was light and airy. We cut it with scissors but it was easy to tear apart too. While I can’t honestly say this is an exact replica of the best pizza I ever ate, it’s far better than anything from a chain pizzaria. Posted in recipe and tagged baking, pizza, vegetarian. Bookmark the permalink.